By the late 1970s, there was an emerging belief that armor may have had its day. New anti-tank weapons borne by helicopters, infantry, and a new generation of anti-tank missiles, as well as Soviet tank armament, made the US consider if armor was worth pursuing for anything other than the Main Battle Tanks. As such, the question of the day was whether mobility could replace armor as the main means of survival on the battlefields of the 1980’s and 1990’s. To validate this thought process, a series of mobility vehicles were developed by the US Army and Marine Corps together, as part of the Armored Combat Vehicle Technology (ACVT) program in a wider look at how advanced technology could improve armored vehicles in terms of lethality and survivability. One element of survivability was mobility. Work had already been undertaken in this regard by the late 1970’s by the US Army Engineer Waterways Experiment Station (WES) in Mississippi, and this vehicle was reused for the ACVT program of tests by the US Army’s Tank Automotive Research Development Command (TARADCOM). The work by WES had actually started in 1976. It was meant to develop a mathematical model for calculating the interactions between track-laying vehicles and different types of soil. By 1978, the WES model had been completed and required validation tests with a real tracked vehicle which was scheduled for 1979. For mobility trials, three vehicles were selected for modification and experimental use. An M1 tank from General Motors known as the Automotive Test Rig (ATR), an M60A1, and an M113A1. 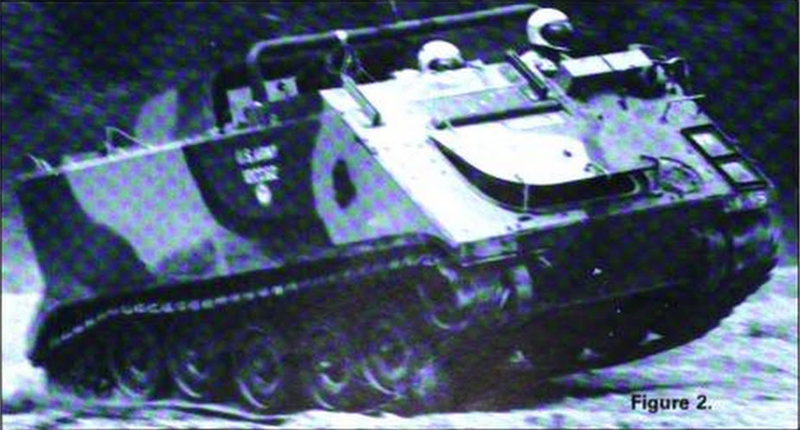 Special vehicles were also developed, including the High Mobility Agility Vehicle (HIMAG), specifically built to study the centre of gravity, spring and suspension damping, and wheel travel at high speed, but it was the ubiquitous M113A1 which was to see the most unusual modification. 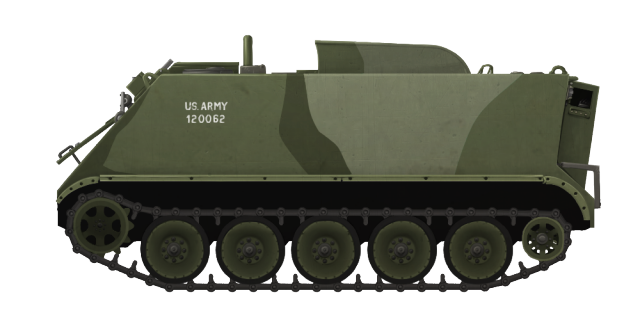 The WES modified M113A1 had the standard automotive pack replaced with a new twin-engine delivering an impressive 86 gross-horsepower per ton (compared to the 36 ghp/ton on the M1 ATR). The purpose of converting this M113A1 was to test issues relating to resistance offered by different types of soils rather than producing some kind of super-fast Armored Personnel Carrier (APC). As such, this vehicle, nicknamed ‘HOTROD’ (a ‘hot rod’ usually being a classic car modified for increased performance) by its developers, was never intended to be anything more than a test bed. It was also, obviously, no longer a standard M113A1 and was officially designated M113A1/2E, but is also sometimes referred to as the High-Speed Technology Demonstrator (HSTD). The standard M113A1 used a General Motors 6V53 diesel engine producing just 215hp. The engines fitted to the M113A1/2E were the 7.2 litre (440 cubic inch) V8 Chrysler RB440 petrol engines and there were two of them. This meant that the M113A12E effectively had a 14.4 litre (880 ci) engine delivering 800hp, nearly four times more than the standard vehicle. Fitting this much power inside the vehicle was not without a price, however. The transmission had to be changed in order to cope with this increase in power and this took the form of a pair of modified A727 Chrysler TorqueFlite automatic transmissions. The entire troop space was used up with the new automotive components which rendered this APC utterly useless for its original role and on top of the former troop space was a huge air scoop to deliver the large amount of air required for these engines. The changes continued at the back with the entire door and ramp arrangement removed and replaced instead with a large grille to cover the radiators. This had no ballistic value and was merely for tests. Underneath this grille were the four exhaust pipes from the engine. The top front of the hull was cut away and a low open-topped casemate was built over where the original engine had been and fitted with a plastic windscreen. This position would allow for up to two observers to be situated during the trials. It is not known if seats were provided internally for this purpose. The driver’s position remained unchanged, except for his hatch which was also removed. Finally, a large goal-post shaped roll bar was added to the top of the vehicle in case the vehicle fell over during testing. The M113A1/2E ‘HOTROD’ was tested alongside the HIMAG and M60A1 on a rough 20 km long test course comprising 189 different types of terrain segments summarising 5 distinct types of terrain designed to emulate conditions ranging from Germany to the Middle East. A standard M113A1 had already provided data from the course and the M113A1/2E was substantially better off-road compared to that vehicle, managing 49 mph (79 km/h) compared to 23 mph (37 km/h) for the standard M113A1. In terms of acceleration, the difference was even more obvious. The M113A1/2E could accelerate from 0 to 20mph in just 2.9 seconds compared to 33 seconds for the unmodified M113A1. Even so, it was still substantially worse than both the HIMAG and the M1 ATR, and both the M113A1/2E and M60A1 were consistently the worst of the four vehicles tested for these trials. The Armored Personnel Carrier M113A1/2E ‘HOTROD’. Note the air-scoop on top of the vehicle that gave it the ‘HOTROD’ name. Illustration produced by Andrei ‘Octo10’ Kirushkin, funded by our Patreon Campaign. The M113A1/2E ‘HOTROD’ was a testbed. Designed initially to test soil strength it found another use for testing out matters relating to the US military high mobility vehicles, but it was in of itself just a one-off. Just this single vehicle was modified and by about 1982 it was no longer required. 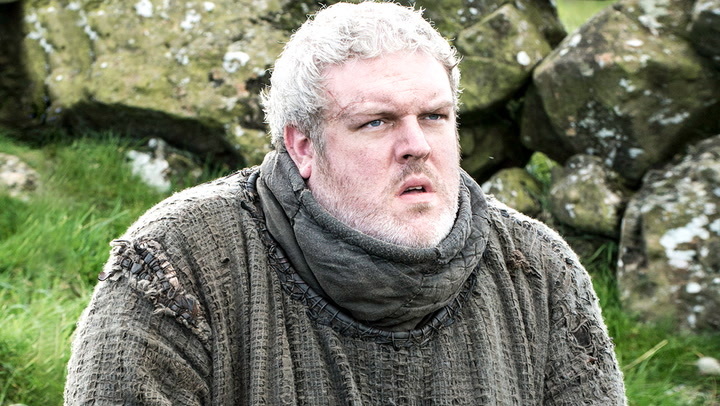 R.P. Hunnicutt reports that this vehicle, tested at Fort Knox, Kentucky, in September 1979, achieved an average speed of 75.76 mph (122 km/h) along a 500 foot (150 m) gravel track. WES tests confirmed a top speed of 49 mph (79 km/h) off-road, making this the fastest version of the M113 ever made and in fact, also one of the fastest tracked vehicles ever made. 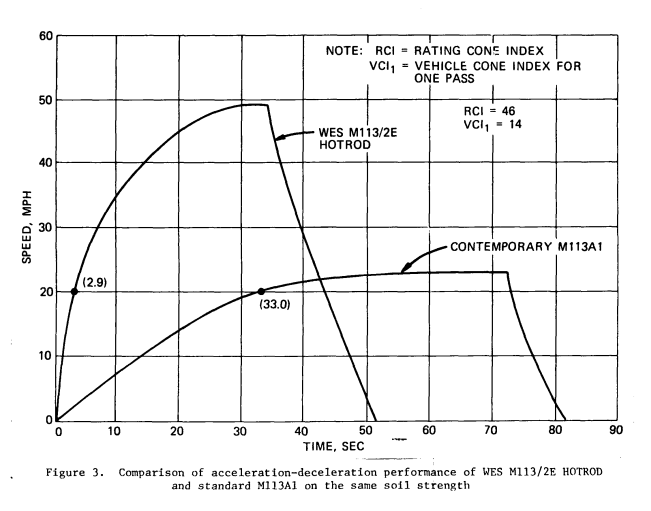 The trials of the M113A1/2E were successful in terms of proving that it was possible to improve the automotive performance of the M113 in general. They had also validated much of the work on the HIMAG and overall shown that mobility does decrease the chances of being hit by enemy fire, but that aggressive manoeuvering offered only a marginal increase in survivability. As such mobility in of itself was not the solution. Vehicles still needed protection and high mobility came at a price. For this vehicle it came at a price of being useless for its original role but the temptation of designers, planners, and generals to have more ‘mobility’ did not go away and to the present day many in the armored vehicle world see mobility as a panacea for a lack of protection. These experiments proved that it was not but, just like Walter Christie showing off his fast tanks in the 1930’s, the lure of super-fast armored vehicles endures. For the M113A1/2E HOTROD though it was over, having served its role as a test bed, the vehicle was retired, and perhaps because of the extent of the modifications done it was not put back into service. Instead, it was moved to a hardstanding outside the US Army Engineer Waterways Experiment Station (WES) in Mississippi, where it still stands today. Armored Combat Vehicle Technology (ACVT) Program Mobility/Agility Findings. (1982). Lt. Col. Newell Murphy. Mobility Systems Division, US Army Engineer Waterways Experiment Station, Mississippi. Now this is a tank!! With this thing useless as an APC having had all the interior space taken up they could have tinkered with the idea of using it as a scout vehicle. Decent armor and good speed. It could go in quick and get out quick. The specifications are inaccurate as the Hotrod was unarmed.